L-R Mike Devenney, Moray College; John Spencer, Inverness College; Iain Macmillan, Lews Castle College, Stornaway; Boyd Robertson, Sabhal Mòr Ostaig; Laurence Mee, SAMS; Bill Ross, Orkney College; Michael Breslin, Argyll College and Hector Morrison, Highland Theological College. Last week’s newspapers were dominated by the Jubilee celebrations and turbulence; the economic kind hitting Europe and the jet stream unusually far south, soaking the thousands of people gathering to greet the Queen. Late on Wednesday, my daughter Annie and I were in our kayak basking in the warm evening sunshine, shimmering in the limpid waters of Ardmucknish Bay; the southerly jet stream is giving us a dry summer to remember. We were off to Inverness early next morning to participate in the installation of the Princess Royal, Princess Anne, as the first Chancellor of the University of the Highlands of the Islands. 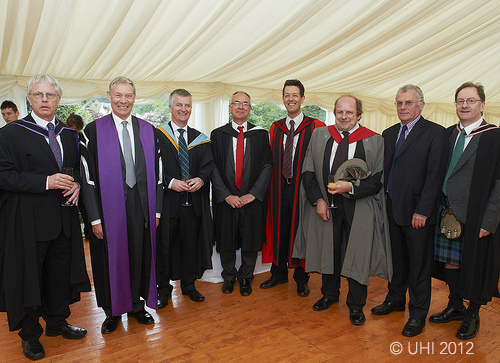 SAMS, a founding partner in the UK’s newest university, is one of the 13 hazel leaves on the new UHI coat of arms. The UHI is a remarkable federation of colleges spread across one of the most sparsely populated regions of Europe. It is not easy to devise an effective and inclusive governance system for such a heterogeneous organisation and this is a topic of intensive discussion at this time. As I sat on the choir stalls of Inverness Cathedral, watching the ceremony with my fellow academic partner principals, I began to reflect on the whole debate between centralised power, federalism and contemporary tribalism. This unresolved debate affects us at all levels: globally, whether or not we intervene in national conflicts (Syria, Libya, Afghanistan, etc) and to protect our shared environment; regionally, whether or not we move towards fiscal union to reinvigorate the European economy; in the UK, whether or not we maintain the Union; locally, the balance of authority between regional and local administrations; and in the workplace with monolithic, corporate and ‘cloud’ management structures. There is no easy answer to these dilemmas and they are deeply ingrained into our value systems and how we define the nature of civilisation. Despite the lack of a black and white solution, we can employ hindsight for a better sense of when governance goes badly wrong. I remember when I was twelve being taken to the line of razor wire and minefields that snaked across Germany, dividing East from West. It had been constructed two years earlier to embody the ‘iron curtain’ and it divided towns, villages and families. As a self-styled ‘Democratic Republic’, East Germany suffered the hardships and stagnation of totalitarianism and Soviet hegemony whereas the neighbouring ‘Federal Republic’ was a hive of positive-spirited post-war ‘can do’ entrepreneurship. The image has remained with me during subsequent work in some 45 countries and triggered my interest in the diversity of political models that I was experiencing. The federalist model certainly isn’t ‘one size fits all’ though and for some countries, unitary governance (a single country with low levels of devolution) works well. For success, cultural and geographic diversity needs to be reflected in the political structure but the threshold between unitary, federal and associate (a weaker form of alliance) is circumstantial and inevitably controversial. In my UN career, I facilitated discussions between countries with different political models and these were always complex. Discussions between Uruguay (unitary) and Argentina (federal) on environmental protection of bordering rivers for example, required some negotiations between the two central governments and some between a central government and the neighbouring state government (though this had to be sanctioned by the central foreign ministry). Scotland has responsibility for the environment of its offshore waters (devolved under the UK Marine and Coastal Access Bill) but fishing in these waters is controlled by legislation from Brussels (the EU Common Fisheries Policy, CFP) and Scotland is represented in negotiations by a UK government minister. It is not my purpose to comment on the logic of this process but the complexity is glaringly obvious. The UK and Scottish governments are united in their desire for a more regionalised CFP (a move opposed by several countries) and it remains to be seen whether or not this can be achieved and will lead to a more coherent approach to representation. Another key facet of governance is public trust in the current political model. In their book Disaffected Democracies, political scientists Susan Pharr and Robert Putnam showed a huge decline in confidence in governments, political parties, and political leaders in Western Europe, North America and Japan during the 80s and 90s (and probably beyond). The UK exhibited the largest decline of all: almost 2.4% per year over that period. Our own surveys of trust in governments to manage the oceans have reflected this view. Why has this happened? Pharr and Putnam suggest three basic reasons: (1) the increased information available to the public (mostly from the media) about government performance; (2) the expectations for good governance have increased; and (3) the performance may have genuinely deteriorated. One of the reasons given for a perception of decreased performance is the “growing incongruence between the scope of territorial units and the issues raised by interdependence, reducing the output effectiveness of democratic nation-states”, in other words, disempowerment at a more local level because of the perceived inability to influence higher level decisions. This goes straight back to my point of getting the balance of decision-making right when setting up federative systems. Only wakes upon the sea"